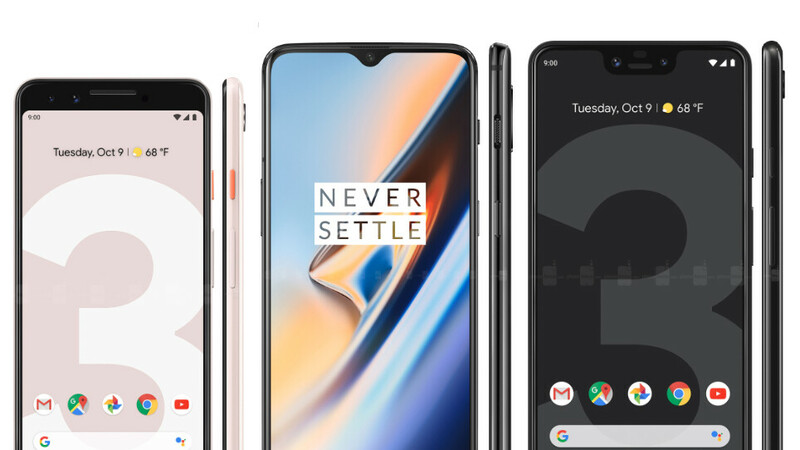 Google Pixel 3 or OnePlus 6T: which one would you buy? For the past couple of years, there has been a trend of price inflation in the smartphone world. When will it end? Nobody knows. What we do know, however is that the Google Pixel 3 launched for $800 and the Pixel 3 XL costs $900. Add $100 to each of those if you want to opt for the 128 GB variant over the standard 64 GB. But hey — to many, it is worth it. You get the "stock Android experience", the way Google wants you to get it. Pure, snappy, fast, with advanced Google Assistant features, and timely updates both in terms of security patches and major Android builds for the next 3 years. Sounds like the proper investment if you want a phone that stays up to date over time. Then, we have OnePlus. A 5-year-old up-and-comer that does not play around, OnePlus phones have been building momentum each year and one can say that are close to mainstream nowadays. Maybe somewhere in the peripheral vision of the general public. In any case, the OnePlus 6T is a serious contender — it's the first OnePlus phone to be backed by a US carrier, it looks and feels premium with its high-grade materials, and OnePlus' own take on Android with Oxygen OS is no slouch either. It's fast, it's responsive, and it's one of the cleanest Android experiences out there. OK, build updates are a bit late, but they still do come in an acceptable time frame. And, the best thing is that the OnePlus 6T starts at $550, which is quite the price difference! And, on the 6T, you have things like an under-the-glass fingerprint scanner and that beloved hardware mute switch on the side. On the Pixel 3, you have "squeeze to call Assistant". So, if you were to buy one of these two, which one would it be? Are the Pixels worth $250+ over the price of a perfectly good phone? Pixel 3 or XL for sure. Nobody does it like Google! A few years ago, I would have chosen Google.... Not today. Same here. If the 6t was released for these prices in my country, I wouldn't pick any other phone except for this, not even the Mate 20 Pro I'm getting. Slap the modded Gcam app on it, install the stereo speakers mod, and you have a flagship device that costs half of what today's flagships are priced at. You need to be rooted for those mods though, right? The phone that I wouldn't mind rooting is any OnePlus phone, they have the best costum roms out there. I have done it before on my Note 4 and I had no issues what so ever. The Pixel 3's have a few extra chips on board. Like the Pixel Visual core AI chip, for AI tasks. That is completely missing off the OnePlus 6T. Also the Pixel 3's have a security chip to ensure that's apps and updates are safe and secure, plus to make your storage secure in general. The Pixels also have Daydream VR and ARCore support. All that is missing from the OnePlus. Also the OnePlus's use a forked version of Android. So it's OnePlus's version of Android. That's basically why I went for the Pixel here. The 6T is much too big for my personal liking. It actually isnt that big. Its just tall and narrower than oneplus 6 itself. Sure. If they were the same price you'd have a point. They aren't. Also no OIS on the 6T camera. No headphone jack, yet no waterproofing (the whole POINT of ditching the headphone jack). Glass back but no wireless charging? No wonder the phone is so cheap. It's a good option, but it's not a flagship phone. It has OIS, it has basic water resistance which most people need. Not everyone takes them swimming. It has much superior DASH charging, ever used one? 60% in 30 minutes, no heating and charges with same speed even when being used. I would anyday use that over dead slow wireless charging. Also Pixel 3 doesn't have jack either. I checked somewhere (forget where) and saw no OIS. I just checked OnePlus US web site which says it has it, so my bad. Thanks for the correction. My mention of the headphone jack is that the reason we keep being given for getting rid of it is to enable waterproofing, yet the 6T takes it away without offering waterproofing. I like wireless charging because I don't have to plug anything in and wear out a port or risk port damage if the phone gets dropped while plugged in, etc. I charge overnight anyway, so it's not an issue, and if I need a quick charge, I can always plug it in. If you're going with a glass back, you should have wireless charging. I like having options, not restrictions. Having wireless charging ability doesn't mean you can ONLY charge wirelessly. The pixel 3 also costs way more, that's why it has wireless chrging and IP rating. Pixel 3 is better in almost every aspect... 3 years instant OS and security updates, dedicated security chip, best front and back camera, Duplex, IP68, front facing stereo speakers, best SW experience, best display, wireless charging, unlimited cloud storage for video/photos, small size phone... What else can we ask??? Worth every penny! The Pixel 3 night photo mode looks pretty amazing, especially considering it's all software. I do wish they had improved the camera hardware more and not just rely on software, but still very impressive. Best software experience is the OnePlus. I must to disagree. A bit faster in opening apps and better multitasking doesn't make it better software experience... Pixel 3 has a similiar software experience like iPhone only on Android side.. everything is smooth, no lags , no app crash.. It just feel so good, at last Android with amazing software experience! Superior DASH charging, are you serious? The price to pay is thick and short cable! By the way, DASH is not superior. Fast charging with higher voltage is much superior because the charging cable is longer and softer!